Autumn is absolutely, positively, indubitably my favourite season. First of all, it has pumpkins. Nuf' said. Secondly, it smells like everything good in the world. Just you wait and see. Last year, I explained how I load up on nummy scented soaps to set the stage for a warm and cozy autumn. Wanting to up the bar a smidge this year, I decided to incorporate some happy-smelling home decor into some lazy Sunday craft-time with my nephew. I don't personally remember doing this as a kid, but a coworker mentioned cinnamon dough in passing and I knew instantly I was going to fall in love with it. Cinnamon is much smoother than salt, and the smell is perfect for the transition between fall and winter. 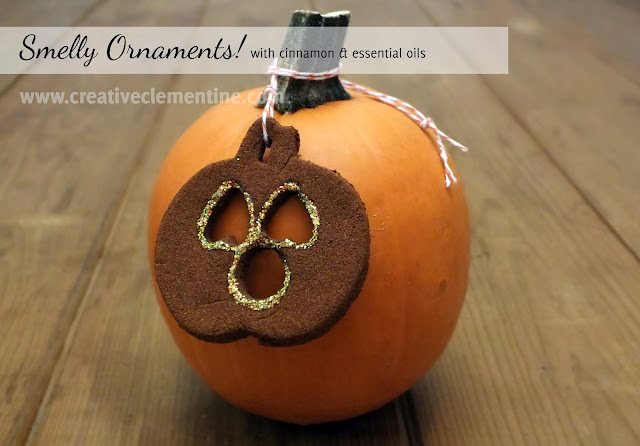 Knowing I am a sucker for a sweet smell, I decided to add some essential oils to the mix to make sure these smelly ornaments really earned their name. 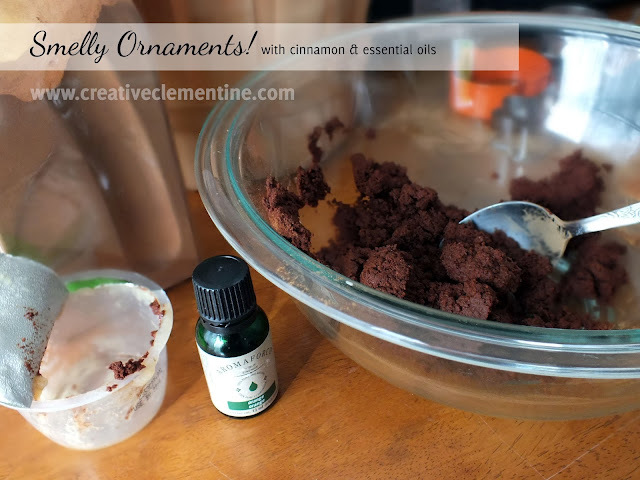 Simple + Natural DIY "Smelly Ornaments"
Mix all ingredients in a bowl, adjusting amount of apple sauce as needed to form a soft dough. Roll out the dough on parchment paper, and cut out shapes of your choice. Be sure to add a hole at the top for hanging. Patient drying method: Set aside for a few days, turning over every day until dry. Impatient drying method: Put on a baking sheet and let it sit in the oven on low (170 F) for an hour or two until dry. If desired, add glitter! Otherwise, hang up in conspicuous areas of your home and let the smelly times roll. The great thing about these ornaments is that you can choose to be serious, or you can go a more playful route. As you can see, this was a project with a four year old boy so pumpkins and glitter paints were involved. You could, however, adapt it to a more sophisticated shape if sparkly jack-o-lanterns aren't your thing. This DIY is super simple and adaptable! I dare you to go try it. Right now. Make it classy!